This spring event brings together more than 32,000 riders from around the world to wheel through NYC’s completely car-free thoroughfares. The 40-mile route, for all ages and skill levels, travels through all five boroughs of the city before ending on Staten Island. 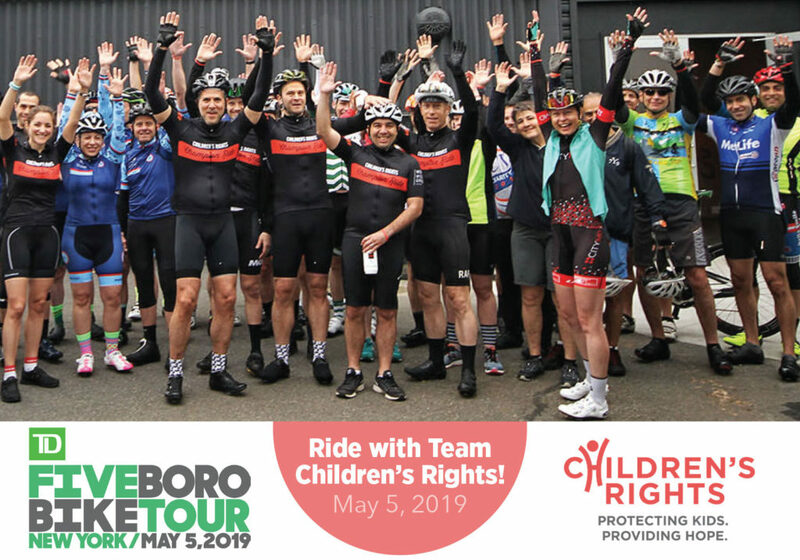 Children’s Rights is proud to offer a limited number of guaranteed charity slots for the 2019 TD Five Boro Bike Tour! By riding with Children’s Rights, you’ll raise funds for our mission to shine light on the struggles of America’s vulnerable children, and support our mission to keep them safe and on a path to loving homes. For more information about riding with Children’s Rights, download our one-pager here. Visit the TD Five Boro Bike Tour event website here. If you have any questions, please contact Mary Grace Cobbs at mcobbs@childrensrights.org or 646-216-3308.